Today’s punch line courtesy Josh Fitzgerald’s vote for ArcTan. Josh also pointed out ArcTan has two horizontal asymptotes, and sends a compact interval to the whole real line. Justin Brown noted e^x makes differentiation easier. Hope Gerson said the logistic function was cool because it goes up quickly then evens out at the top. And Chris McCord liked that reciprocal was it’s own inverse. Thanks to EVERYONE who voted - and especially to the 8 people who read last week's comic. Sine’s full reaction is next week. MAUD: It’s decided. Sine is our president. VERSINE: If my 7% had gone to Para, she could have won the majority instead! Thank me! 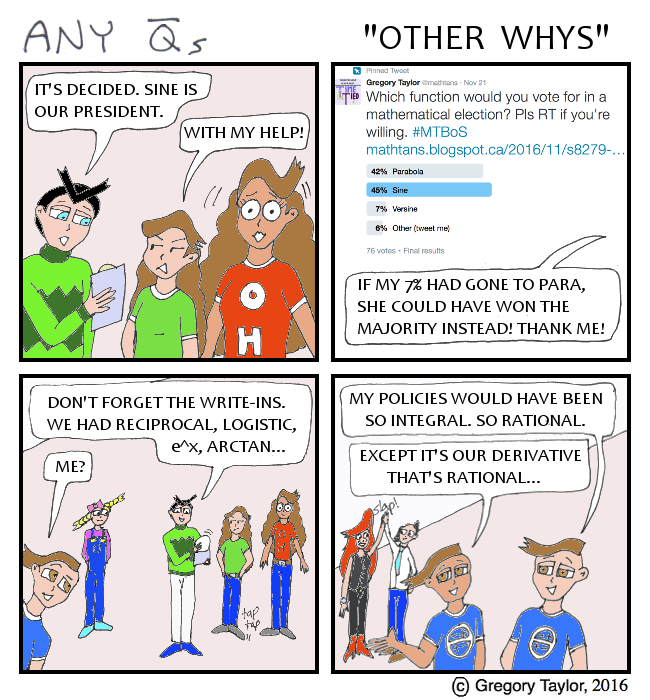 ARCTAN: My policies would have been so integral. So rational. Para is quoting Spock from "Star Trek: TNG". Sine is quoting Jedi from "Star Wars". Versine went for "Battlestar Galactica" followed by "Babylon 5". I've actually been waiting on a BSG reference since news of the film reboot. PARA: The union of i-Tans and Q-Tans will not be achieved by politics. But it will be achieved. And I must help. QSINE: Many of the truths we cling to depend greatly on our own point of view. It’s only different in our minds - we must unlearn what we have learned. VERSINE: They evolved. They rebelled. There are many copies. And they have a plan. Vote for me. 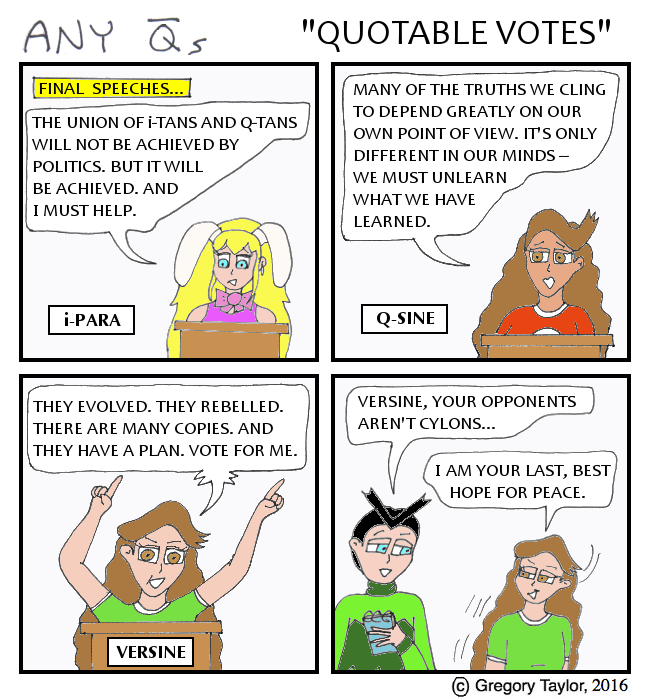 VERSINE: I am your last, best hope for peace. Don’t underestimate the power of hurt feelings. I realized we never checked back in with Sigma after QT’s Unification, so here’s what they’ve been up to. If you came here expecting Cured Meats, have this link. If you came here expecting Pretty Cure, have some transformations. SIGMA: Barrier Jacket! Mean Median Mode! (Hyper/Sigma fires beam at ParaB) ZAP! QT: Still no good. I don’t think we’ll get ParaB cured in time for the vote. HYPER/SIGMA: I dunno. A bit more smoking and she might be “cured”. According to my research, the subjective (or nominative) case means the noun is the subject of the verb, as in “I hate”. Meanwhile surjective means what Maud said. And alert readers may recall the old serial played around with Jectives before, back in Entry 123. Coincidentally, there is a bi-election coming up in my riding soon. There’s also that thing happening down in the United States tomorrow. MAUD: QLyn dropped out, throwing support to QSine, and Rhys dropped out, his supporters choosing Versine. So it's a choice of those three. QRADIK: And it’s all subjective. MAUD: No, surjective. Each final candidate was mapped onto by at least one other. MAUD: Or had you meant the subjective case for nouns? QRADIK: I just hate this election.